Preheat the oven to 200°C, gas mark 6 and cook a 1kg pack Waitrose Lamb Shanks with Redcurrant and Rosemary, according to the instructions on the pack. Meanwhile, peel a 500g pack organic sweet potatoes. Place on a baking tray and roast whole in the oven for about 40 minutes or until tender. Mash the sweet potatoes with 2 tbsp crème fraîche and 1 tbsp chives, chopped. Lightly oil the inside edge of a plain 8-9cm round cutter and place in the centre of a plate. Pile the mashed sweet potato mixture inside, smooth the surface, then remove the cutter. Repeat with the second serving. 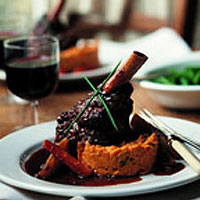 Top with the lamb shanks, spoon the sauce and vegetables around the edge, garnish with extra chives and serve with green beans. A full-bodied French red with herbal notes would be perfect with this richly flavoured dish.